Someone once said, “A musician is someone who loads $5,000 worth of gear into a $500 car to drive 100 miles to a $50 gig”. No matter what price you command, your gear is the most valuable part; not just to you but to potential thieves too. Protecting your equipment while you’re on the road is one of the constant headaches of being a musician. So we’ve created a handy guide on how to keep your gear safe while you’re on tour. Touring is an important part of being a musician; some artists can spend months away from home at a time. While it’s easy to romanticise life on the road, it can also be where your gear is at its most vulnerable. Once his gig is over, he rarely lets his gear out of his sight and keeps it with him at all times. Riley also feels that he needs to be more vigilant in the US than in the UK. Car, vans and even buses can be easy to break into so never leave your gear in your vehicle overnight. However, it can be even easier to steal a trailer. Texan band, Los Igualados, had their trailer stolen from a hotel carpark in Texas in July, containing over $50,000 of equipment. If using a trailer, make sure you use a wheel clamp, alarm and a hitch lock to deter thieves. Mind you, theft is not the only issue when you are on the road. Instrument and equipment damage can also pose a problem. The Bayonettes, an alternative indie rock band from Portsmouth, have been travelling the UK this summer, going from festival to festival. 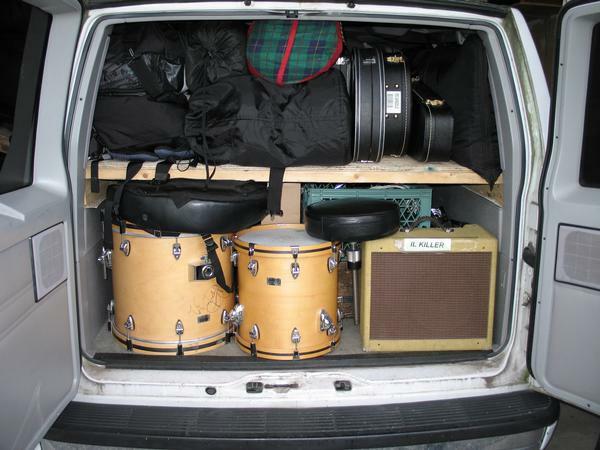 They use a Volkswagen Transporter van, which normally contains a drum kit, guitar amps, pedal boards and guitars along with various spares, accessories and merchandise. “Most of our gear is stored in hard flight cases so if it gets bashed about, the equipment inside doesn’t get damaged. The cases are all locked and marked with our logo,” said John Whittle, vocalist and rhythm guitarist. Having your logo plastered all over your equipment also helps prevent someone accidently taking your kit at the venue, and can also make it harder for a thief to sell on the gear as quickly. Avoid leaving your instrument(s) in view. In fact, don’t leave them unattended in the car if at all possible! Have decoys: Putting low-quality equipment to the fore could deter thieves. Use flight cases: This helps reduce damage in transit and like the Bayonettes, put your logo on them if you can. It’s not just your transport that your gear can be stolen from. Thefts from inside music venues can also be a problem. In 2015, Bill Bailey had his whole tour bus stolen after the thief managed to get into the backstage area Liverpool Philharmonic, and steal laptops and the keys to the bus. The tour bus was eventually recovered. When you get to a venue, ask if there’s a safe place to store your equipment and make a checklist to ensure nothing is missing at the end. It can be easy to miss things when it’s late and you’re tired after the show. “Most venues are good at providing storage backstage where it’s relatively safe. We also have a tech spec, which is checked off before we leave anywhere,” said John Whittle. What do the security experts say? Though the risk of theft and damage can never be totally eliminated, steps can be taken to reduce the risk. We spoke to a security expert, Anthony Neary, Managing Director of safe.co.uk, adviced how bands and musicians can protect their gear while on tour. Equipment insurance: You can cover your instrument(s) from theft and damage no matter where you are. If you are touring outside the UK, you simply need to add on European or worldwide cover. Some policies include ‘new for old’, which means your instrument(s) will be replaced with a new one if lost, stolen or damaged, and less than three years old and was purchased new. Or, less than 18 months old for laptops. Musician insurance: If you are performing in venues then you will need Music Liability cover. This is essentially Public Liability insurance and covers you in case you injure another person, damage third-party property or cause damage to a venue you are playing at. Some policies also include Professional Indemnity cover, which can cover you if you give advice to others that results in a negative outcome. Band insurance: This covers everyone in the band, group or orchestra for Personal Accident, Music Liability, Equipment and Performance cover. Performance insurance: If you get paid to play, this type of insurance will cover you for loss of earnings, equipment breakdown and music equipment hire. Insure4Music offers tailor-made band, instrument and musician insurance across the UK. Get an instant quote today!